House Democrats have approved a plan to re-open the government without funding President Donald Trump’s promised border wall. The largely party-line votes by the new Democratic majority came after Trump made a surprise appearance at the White House briefing room to pledge a continued fight for his signature campaign promise. The Democratic package to end the shutdown includes a bill to temporarily fund the Department of Homeland Security at current levels through Feb. 8 as bipartisan talks continue. It was approved, 239-192. Democrats also approved, 241-190, a separate measure funding the Agriculture, Interior and other departments through Sept. 30. President Donald Trump has spoken to the family and former colleagues of the Newman, California, police officer who was shot to death during a Dec. 26 traffic stop. The suspected shooter is a Mexican man accused of living in the U.S. illegally. White House Press Secretary Sarah Huckabee Sanders says Trump praised Cpl. Ronil Singh’s service and offered condolences to his wife, the local police chief and local sheriff. The calls come as the White House has been trying to highlight the dangers of illegal immigration as Trump tries to rally support for his long-stalled border wall. Trump is demanding billions of dollars to build it, but Democrats refuse to give him the money. The impasse has caused a partial government shutdown that is now in its 13th day. President Donald Trump has made a surprise appearance in the White House briefing room, flanked by border patrol agents championing his demand for a wall on the U.S. southern border. It’s the first time Trump has taken the podium in the briefing room. Trump says the “people in our country want” the wall. He has also congratulated Nancy Pelosi, who was installed hours before as speaker of the Democratic-controlled House. Trump and the Democrats are locked in an impasse with the partial government shutdown in its 13th day. Trump is demanding that lawmakers provide billions of dollars for a border wall. The border agents who accompanied Trump told reporters the wall is essential to stopping illegal migration and drug-smuggling. 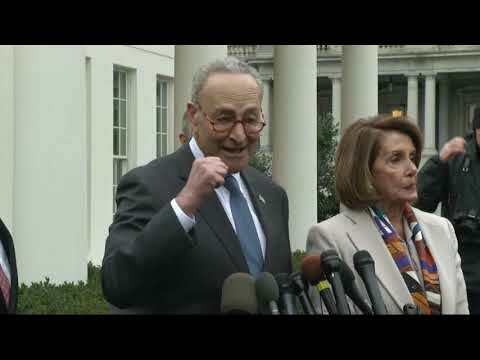 Democratic House leader Nancy Pelosi (puh-LOH’-see) says “there’s no amount of persuasion” President Donald Trump can use to get her to fund his promised U.S.-Mexico border wall. Pelosi says the partial government shutdown stemming from Trump’s demand for wall funding has nothing to do with Democrats. She said in an interview that aired Thursday on NBC’s “Today” show that Democrats want the “Trump shutdown” to end but she’s unwilling to fund Trump’s wall. Pelosi responded to criticism from Trump that she took a trip to Hawaii over the holidays, while he canceled his planned visit to Florida because of the shutdown. Pelosi says, “The president may not know this, but Hawaii is part of the United States of America.” She says she was available on 24 hours’ notice. Trump has said the shutdown will last “as long as it takes” to get the wall funding he wants. President Donald Trump and congressional officials plan to try, try again Friday after their meeting at the White House didn’t succeed in producing a budget agreement that would end a partial government shutdown. Trump says he isn’t budging either and that shutdown will last “as long as it takes” to get the funding he wants for a border wall with Mexico. The new Congress with its Democratic-controlled House will convene Thursday. Republicans who control the Senate are hesitant to take up the Democrats’ budget package without Trump on board.